Video Compressor - How to Compress Video MP4, AVI, MOV, MKV, WMV, MPG, FLV, 3GP? I want a converter or compressor software to compress videos with highest quality. I just want highest quality. I was looking for MP4 compressor to compress MP4 files. Does anyone know ideal video compression software? Looking for MOV compressor which works on Mac and supports to compress MOV files from QuickTime. I'm trying to start a new channel on YouTube and I can't upload to YouTube because my file sizes are huge. Could someone recommend me some video compression software? I rip streaming files to my computer and put them on my iPod, however some of the files are too big. I need a video compressor to compress them. I am interested in uploading videos to YouTube with footage of gaming. However the .avi file is too large. Does anyone know an AVI Compressor to compress AVI files? I just wondered if an easy way that will compress MKV files. It would be better if anyone can recommend a professional MKV Compressor. My Canon EOS 60D record video to huge MOV file, about 2GB for ten minutes, can I compress it? Why People Want to Compress Video? Reason One: Everyday, thousands of people share their video and movie by of uploading videos to fashionable video entertainment websites like YouTube, Dailymotion, Vimeo, and more. However, most of these video sites have limitation about the size and duration of the upload video, such as YouTube Official Website says: The maximum file size is 128 GB and the maximum duration is 11 hours. If the size of your source video files is off-limits, you have to compress video to make them meet the requirement. Reason Two: Now, more and more people cannot be satisfied with watching videos or movies online. They want to bring them anywhere and enjoy them anytime by means of transferring videos and movies to their devices like iPhone, iPod, iPad, Android phone, Android tablets, BlackBerry, etc. But the memory of those devices is limited. In order to put as many as possible videos to them, people choose to compress video to smaller one. Faasoft Video Compressor is the best video compression software so far, which supports compressing almost all kinds of video like compress MP4, compress AVI, compress MOV, compress MKV, compress WMV, compress ASF, FLV, MPG, 3GP, etc. To have Faasoft Video Compressor is equivalent to have a MP4 Compressor plus an AVI Compressor plus an MOV Compressor plus an MKV Compressor plus a WMV Compressor, etc. Furthermore, Faasoft Video Compressor also performs as a powerful video converter. With it, you can convert among most video formats like MP4, AVI, MOV, WMV, MKV, ASF, FLV, OGV, 3GP, XMV, DV, HDV, DV-AVI, DivX, Xvid, SWF, MXF, MVI, OGM, WebM, VP8, MPG, MPEG-1, MPEG-2, MPEG-4, MJPEG, MJPG, H.263, H.264, Apple ProRes, R3D, Fraps video, BIK, Flip movies, AMV, etc. Better still, Faasoft Video Compressor is an all-in-one video player, editor and downloader. More functions wait to explore. Faasoft Video Compressor supports three methods to compress video: adjust video bitrate, decrease video size and convert video to H.264 MP4 which has higher compression rate than others. Before compressing video, please free download Faasoft Video Compressor first and then install and launch it. Click "Setting" button of Faasoft Video Compressor to "Advanced Setting" tab. In this tab, click "Advanced" option. Choose the parameter from the drop-down list of the right side of "Bitrate" or just enter parameter as your need. Then click "Apply To All" and "OK". Finally click "Convert" button to compress video. Click "Setting" button -> "Advanced Setting" tab -> "Advanced" option. Select desired video size from the drop-down list of "Video Size". It also allows overwriting any desired video size. 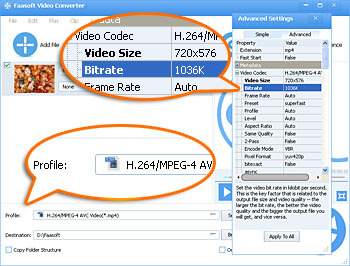 Click the drop-down button of "Profile" to select "H.264/MPEG-4 AVC Video (*mp4)" as the output video format. The first and second methods apply to any video format and can compress video to any size as you want. But you should know that the more you compress the video and the worse the video quality gets, so please also pay attention to the video quality when you reduce video bitrate and video size. After all parameters are set up during the first and second methods, you can also click "Profile" drop-down button to choose the output formats as you want. The third method only applies to the video you want to compress like compress MP4, compress AVI, compress MOV, compress MKV, compress WMV, compress ASF, FLV, MPG, 3GP, etc. Besides, this way will keep the output video in relative high quality. © Copyright 2014 Faasoft. All Rights Reserved.